Posted by Jonny Greenwood on 11/16/2018 3:24:54 PM. As a custom Android tablet, Kindle Fire doesn't have Google Play but Amazon Store instead. Although we can get thousands of e-books in the Amazon Store, the lack of apps makes this built-in store very awkward. 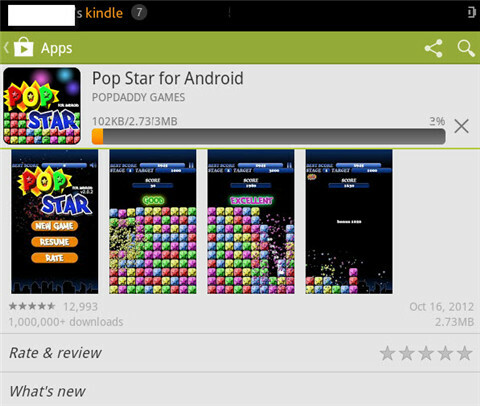 So can we install Google Play on the Kindle Fire? Generally speaking, this is impossible as Amazon has made some restriction on Kindle Fire that if you just simply install the Google Play APK file, it may not run successfully. But things will change if you root your Kindle Fire! 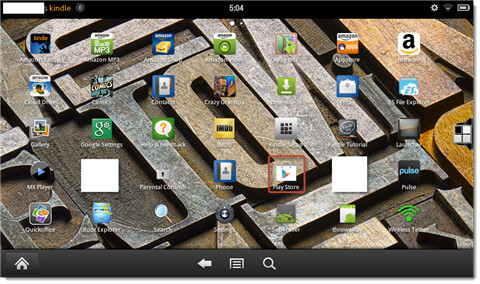 In this article I'll tell you how to install Google Play on a rooted kindle Fire perfectly. It's easy and simple. You don't have to master any professional skills or tools, just do as the tutorial says. Now, let's get started! As you are a Kindle Fire tablet users, if you buy Kindle books from Amazon, you may find they are not possible to share with your family or read on other device. 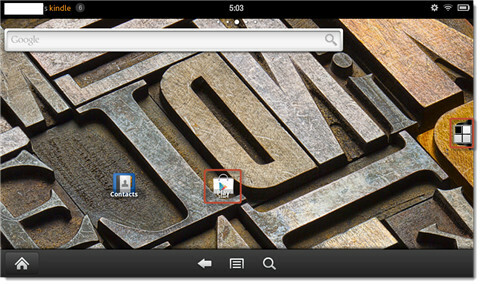 Our Kindle DRM Removal can help you share Kindle books with others, read Kindle books on any device. 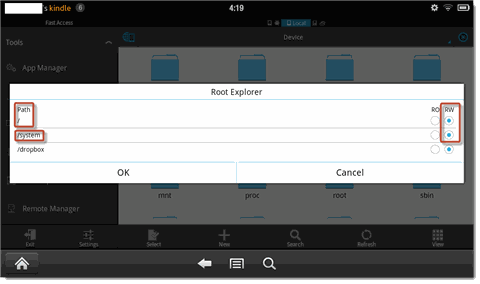 Remember, your Kindle Fire must be rooted! 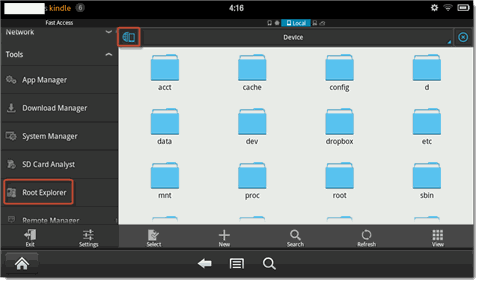 For rooting tutorial, please refer to this article: How to root Kindle Fire. Download the APK files below and transfer them to your Kindle Fire. I suggest you put these files in a folder together so that you can manage them easily. The first three APK files are necessary for running Google Play. Install them with ES File Explorer. You may not find them in the "Apps" list. This is normal. PS: You don't need to do anything about Vending and Google Play Store at this step. 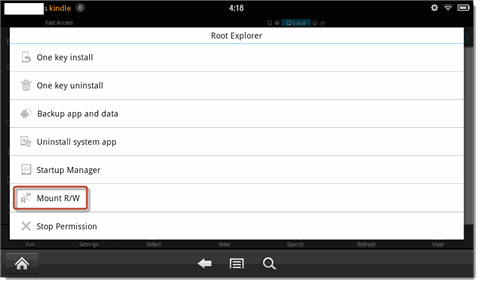 Open ES File Explorer, choose "Fast Access" – "Tools" – "Root Explorer" – "Mount R/W", set "Path /" and "/system" to "RW". Now you've get the permission to write data to system. 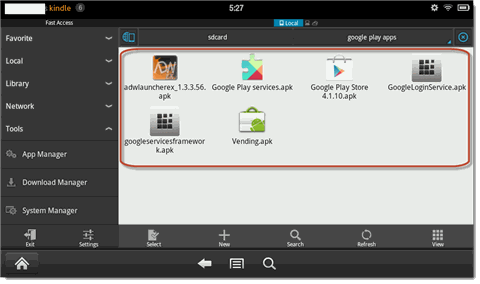 Find the Vending.apk file, press and hold to make it selected. Tap "Copy" and paste it at path: /system/app. 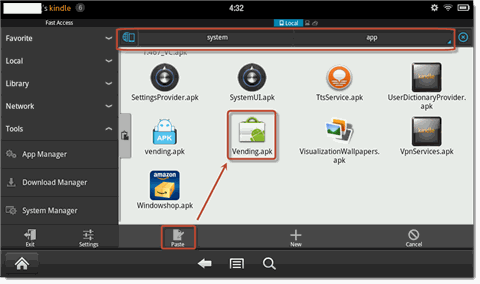 Then tap the Vending.apk to install it on your Kindle Fire. Choose "OK" to continue installing. After this, you need to reboot your Kindle Fire. You may not find Google Play in the Apps. This condition appears on some Kindle Fire, but not every. Actually the Google Play has installed successfully on your device but the original Amazon Launcher doesn't recognize it. In order to solve this problem, you need to install a new launcher. Now just tap and install the ADWLauncher EX I provide in step 1. 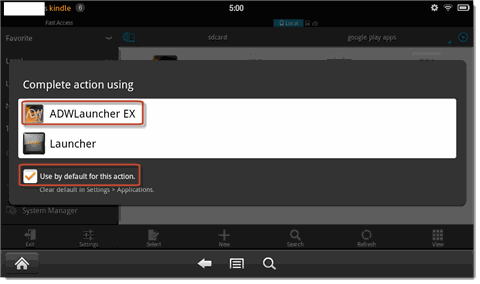 Check "Use by default for this action" and select "ADWLauncher EX". Then you'll find your home page is totally changed and Google Play is the app list! Now just open Google Play and enjoy thousands of apps! 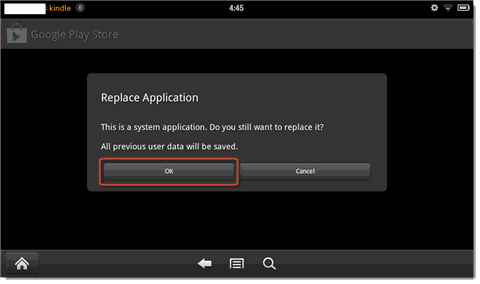 PS: If you want to use the original Amazon Launcher, just call out the quick setting menu, choose "More" – "Applications" – "Filter by: Third Party Applications". 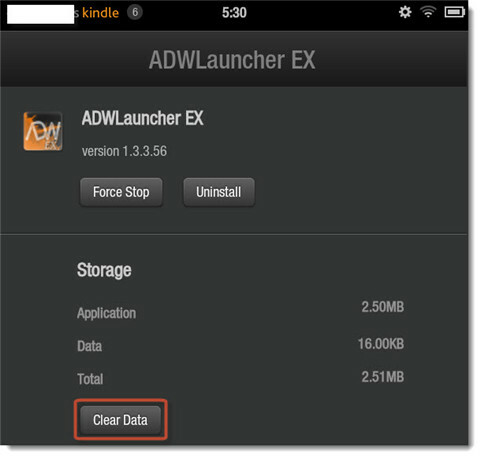 Select "ADWLanucher EX" and choose "Clear Data". Then the home page will turn back to the original Amazon style. Intresting network I like it. Worked like a charm, thanks very much! Thanks for this guide. I used these steps on Unlocked $199 Fire Phone which Amazon purged starting yesterday to clear their unsold inventory. I was able to get Google play (version matching Jelly bean) and also download all the Google play apps.. BINGO!!! Worked like a charm! just followed instruction and had root permission's. this is the only thing that would work for my little brothers kindle. Thank you so much! I am writing to make you understand of the terrific encounter my wife's child developed reading through yuor web blog. She learned a good number of issues, with the inclusion of what it is like to possess an incredible giving heart to get a number of people without difficulty know a number of multifaceted topics. You undoubtedly surpassed readers' desires. Thanks for rendering such warm and friendly, trustworthy, revealing and even easy tips about that topic to Gloria. We are glad to know that our guide can help you solve your problem. We will keep working hard to share more tips and tricks. Thanks. Followed the above instructions on how to install Google Play Services into Amazon Fire Tablet GR8 and it worked. I now have more access to apps than what the Amazon App Store has. Amazon App Store are limited to what you can download and install. Thanks for your sharing, but wish you could help update this article as some steps is not work.